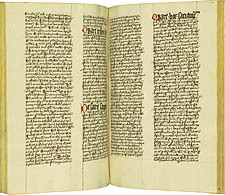 White acquired this early 15th century manuscript Psalter in the 1870s on the basis of a presumed connection to Martin Luther’s seminary in Erfurt. After careful research, however, White and Burr concluded that Luther probably never saw this manuscript. It came from Erfurt’s Benedictine monastery, rather than Luther’s Augustinian monastery. Many of the medieval manuscripts in the collection received this kind of close scholarly attention from White and Burr. Psalterium Glossatum. Latin manuscript on paper. Erfurt, Germany, early 15th century.